The AnyMeeting product engineering team has been hard at work on a number of new enhancements and just released two updates designed to improve your overall web conferencing experience. Increased security. The previous version of screen sharing relied upon Oracle’s Java programming language which has been widely reported recently to have exposed user computers to security vulnerabilities. Download once and you’re done. No need to continually keep your computer up to date with the latest browser and Java versions that often cause conflicts and affect application performance and behavior and frustrate users. Improved screen sharing speed and performance. Our plug-in uses native C++ code which is much faster than Java. This means that you’ll have slightly snappier performance when using the new screen sharing plugin. To get the new Windows plug-in, log in to your account and follow the prompts in the account management screens. Consistent playback. One file means all elements are synched and will play back the same way every time. Better layout. When viewing the new version of recordings, you will notice that the Text Chat area has been removed. This allows us to maximize the video portion of the recording. This is perfect for slide presentations! You may also share yourself on webcam and screen share with a nice crisp large view of the video. Faster processing time. Your recordings should finish consistently faster than before. If you have questions or need help, join our live daily Q&A or visit our support site. Great news guys!! Very exciting! Keep up the good work! Quick Question: Is there any way you offer a report that indicates the names, emails etc. of the attendees to the Webinar and the recordings, too? Yes, there is. To learn more about how to access it – you might want to join our Live Daily Q&A forum http://anymeeting.com/supportteam for tips on how to access it. 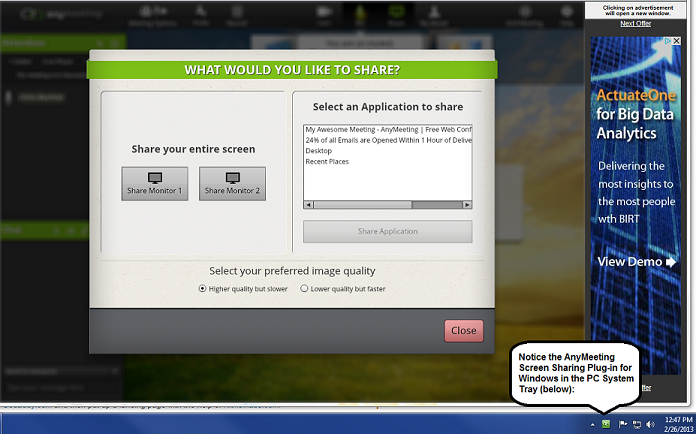 I just tried using the screen sharing and it did not prompt me to download the screen sharing plug-in. I could not screen share about ten minutes ago. I have submitted a report on failure to screen share a week ago #5862 and am still waiting for a reply. Earlier in the afternoon, I used another laptop but with the older version of window and was prompted to download the plug-in. Now I used another laptop with window 7 -16 b and there was no prompting and could not do screen sharing as there was non stop initializing of screen sharing. What if I don’t want to use screen sharing? The screen is blocking me from running my meeting and it starts in two hours!?!? Hi Bob – We check our blog comments daily and just saw this from you for yesterday. Were you able to get your answers resolved? The fastest way to get help is submit a ticket at http://support.anymeeting.com. We’re here to help! Let us know if you still need answers. Please anymeeting for linux screen sharing could be very very helpfull for a lot of poor class people .